Presenting a gorgeous 20th century original large oil on canvas by Jack Lanze. 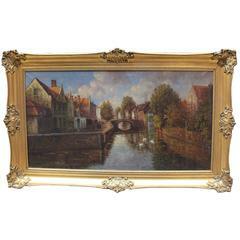 This is a beautiful Expressionist landscape painting in the style of the Dutch or French School. The pastoral scene or landscape is very Dutch or Belgian looking (very flat). The buildings with their terracotta roofs are very continental European in style and the dress of the lady by the pond is very continental looking. Also, the animals depicted are sheep and not cattle. Poultry (including a French cockrell) also in the pasture on the left. Gorgeous colors, beautifully painted by a very talented hand. We have been unable to find any records relating to Jack Lanze, but in our opinion, he was no ordinary painter as this painting exudes real quality. We are of the opinion that this is a mid to late 20th Century piece. Signed in the bottom right. 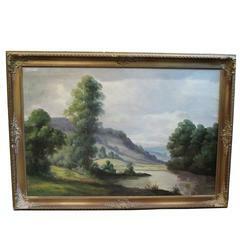 In lovely giltwood frame.